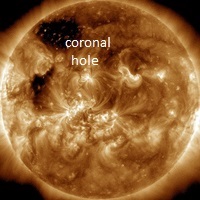 Solar wind flowing from this emerging coronal hole should reach Earth on Jan. 12-13. Credit: SDO/AIA. THE CME HAS ARRIVED: As expected, a CME hit Earth's magnetic field on Jan. 9th (around 20:00 UTC or 3 p.m. EST). Although the initial impact was weaker than expected, geomagnetic storms could still develop as Earth passes through the CME's wake. NOAA forecasters are sticking by their prediction of a G3-class event on Jan. 9-10, which means high-latitude sky watchers should remain alert for auroras. Aurora alerts: text, voice. 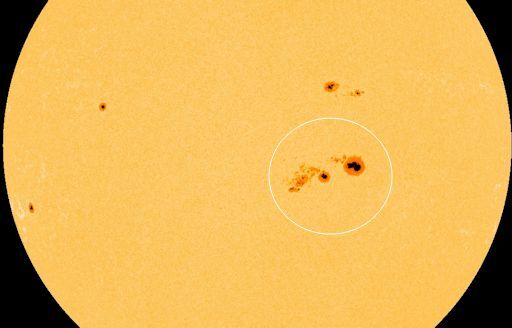 As the image shows, the sunspot is almost directly facing Earth. This makes it a threat for geoeffective eruptions. NOAA forecasters estimate an 80% chance of M-class flares and a 50% chance of X-flares on Jan. 9th. Solar flare alerts: text, voice. Lofted by approximately 200 cubic feet of helium, the balloon ascended to an altitude of approximately 110,000 feet. Its payload contained an x-ray/gamma-ray dosimeter, a GPS altimeter, and a cryogenic thermometer. Together these instruments can form a complete thermal and radiation profile of the atmosphere throughout the flight. Of special interest are aviation altitudes--i.e., between 5 km and 15 km--where planes carry human passengers through the storm. The students want to find out how much ordinary air travelers are exposed during an event like this. The balloon popped as planned on Jan. 8th and the payload parachuted back to Earth, landing in a remote corner of Death Valley National Park. 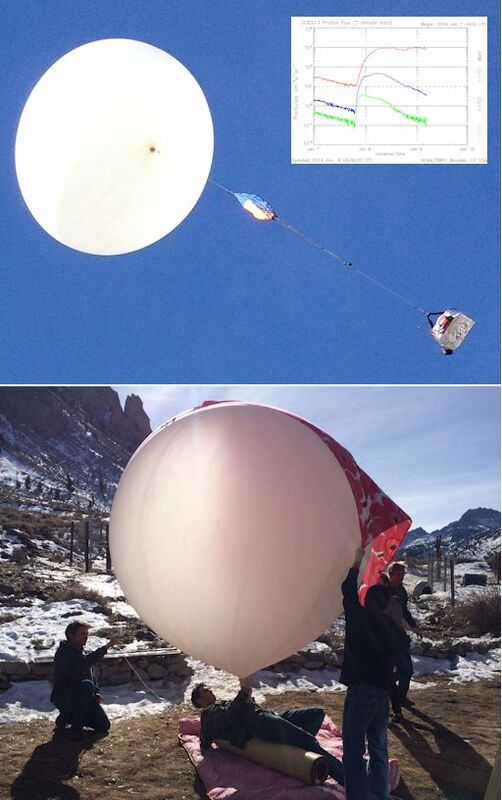 The students will recover the payload and its data on Jan. 9th. Stay tuned for results. Solar flare alerts: text, voice. Shahrin Ahmad of Sri Damansara, Malaysia, took these pictures on Jan. 2nd, 6th and 8th using a 4.5 inch telescope. 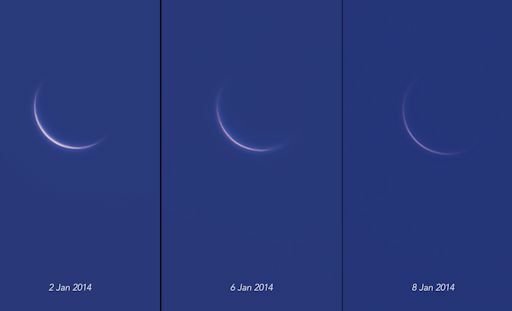 "It us very interesting to see how fast Venus changes in only 6 days! Today the thinning crescent is only 0.7% illuminated at a distance of 7o from the sun." On Jan. 8, 2014, the network reported 20 fireballs. On January 9, 2014 there were potentially hazardous asteroids.